The old city of Linz is scenic. Sitting inside a west-to-south bend in the Danube River, it includes a beautiful palace walk on the south bank, a tremendous number of gorgeous churches, and some terrific shopping. While the surroundings are very industrial and commercial (not unusual for Danube River cities), the old city preserves plenty of the color and architecture that makes Austria such a popular tourist destination… although Linz is far lesser known than, say, Vienna. The Linz Schloss (Palace) was my first stop on the south bank. 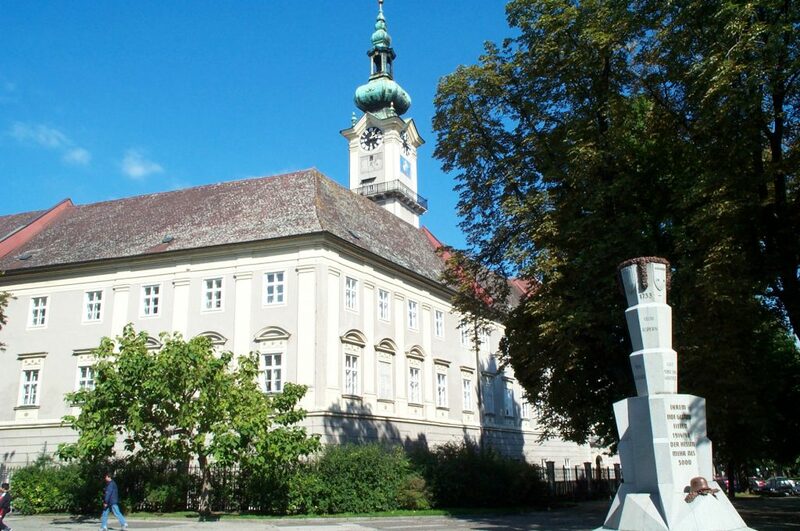 It is located on high ground directly over the river (a full distant view of the palace is located on the Danube River – Linz page). The palace itself is currently configured as a simple (though massive) plain white block structure which suggests it having been rebuilt. It certainly contrasts with the original palace walls, a small portion of which is shown in the first photo, dulled and grown over with ivy. Not all the palace walls appear this way — behind me was a fresh stone pedestrian bridge. Alongside the palace was a beautiful river walk that followed the high ground west of the city to a northward bend in the river. At the opposite side of the grounds was a worn observation tower that provided views of the old city. Not far away was the upper entrance to the palace grounds, marked by huge green doors decorated with huge black art-deco eagles (signifying Austria). Venturing around the old city itself, I could not help but notice the heavy concentration of churches. Only in Poland had I seen such a large number of big beautiful churches in such a small area. There were four big ones lined up in a row generally along Landstrasse that runs from the Danube River to near the train station in the south. I caught three of them in the second photo… the Altes Dom was the two-towered building in the far distance, the bright yellow Ursulinenkirche is next to it, then the dark-roofed building in the center is the Karmelitenkirche. The third photograph below shows the Altes Dom from the main marketplace, and it was here that I attended High Mass that Sunday. The celebration was beautiful, especially as Austrians take great pride in church music and the Mass was accompanied by a lovely choir. I got some interior pictures of the Karmelitenkirche but I recalled the interiors of all the churches being similar. They had bright white interiors graced by red marble frames hosting old-style Biblical paintings that have darkened over time. The pulpit was elaborately gilded. These weren’t the only three churches, however. Beyond the Altes Dom is the Stadtpfarrkirche, also very new. Along with these sits in the massive Neues Dom in the center of the downtown, a beautiful Gothic church. 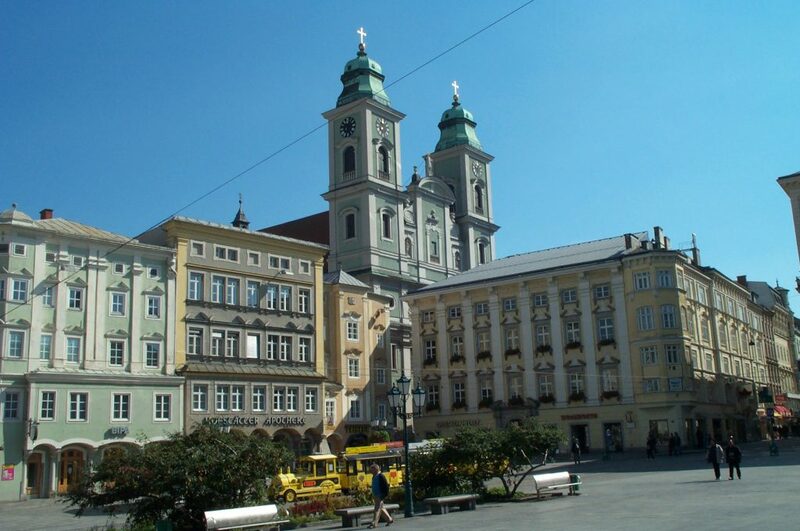 I was astonished to see all these huge churches (and they were huge — easily holding several hundred to a thousand each) in such close concentration, but indeed they are well supported as Austria is a deeply devoted Catholic country. 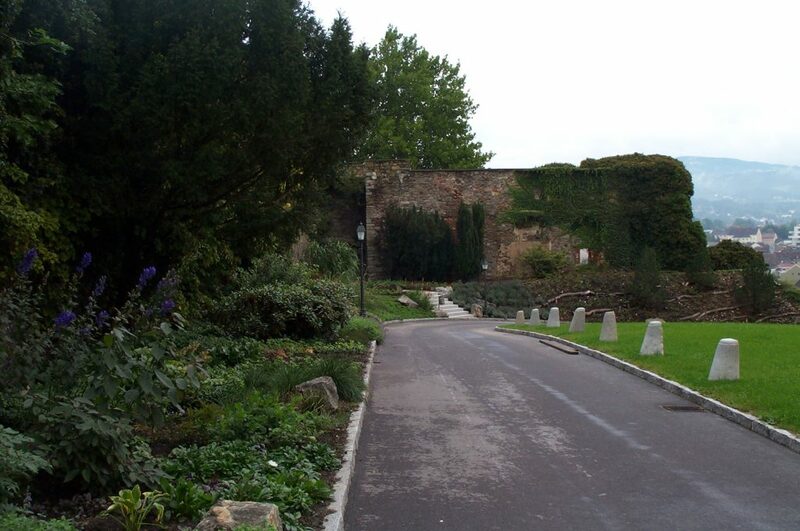 Of course, there is a lot more to the Landstrasse and its environs than Christianity. First, there was tremendous shopping there. 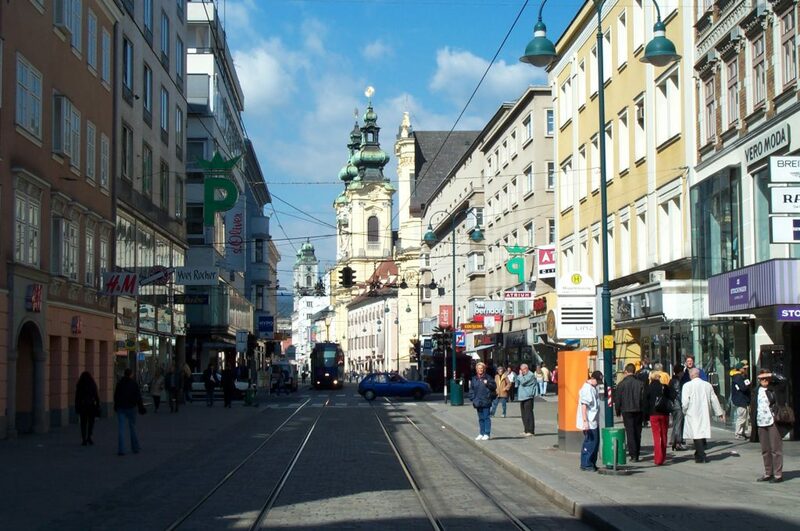 Being an economically powerful city, Linz boasts some of the best shopping around. Intermixed with the old buildings are a number of brand new malls, some six floors high, and they were packed with people, especially from the younger generation. Second was architecture. As with every Austrian city I have visited, the streets were lined and packed tight with beautiful buildings — colored in pastels and lavishly decorated with reliefs. There was not a dull facade in the city. Third was the museums. The Kunstmuseum (art museum) was terrific, both with the artwork inside and its beautiful flower-filled square outside. The Landstrasse also carries one of the main arteries of the city’s streetcar network. There were a whole host of buildings marked as historically significant. Just as in Vienna, such buildings were identified with a common marker — a stylish white placard bordered by two Austrian flags. One of the more prominent of these was the Landhaus (the seat of the province of Upper Austria), in the fourth photograph. Although not easily visible in the photograph, the Landhaus tower has very colorful paintings on all four sides that represent the four seasons. I really loved the inner square of the building with its balconies covered with red flowers. Nearby was the Altes Marktplatz (old Market Square) that contains the old town hall. Back to the churches one last time, I was struck by the Neues Dom (new Cathedral, fifth photograph), both from its beauty and by the way it was set apart from the rest of the old city. 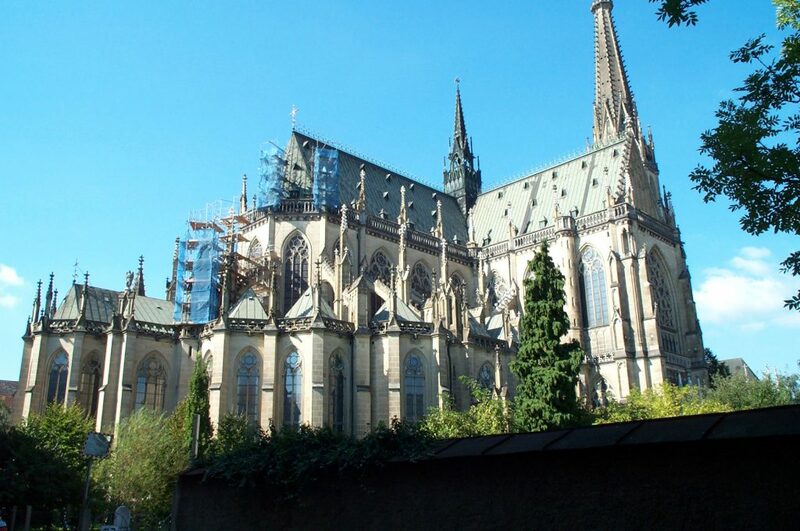 It is formed like a mini-Cologne Cathedral minus the tall columns at the rear but surrounded by a small patch of green and an old stone fence. The old city of Linz was great to walk through as the people came out with the Sunday sunshine, with the incredible architecture I encountered, and with the various historical buildings, monuments, and memorials dotted about the place. It doesn’t quite compare with her better known sister cities of Vienna or Salzburg, perhaps, but it was worth the visit.